The parish of Tasburgh is situated in the southeast of Norfolk. It lies north of Long Stratton, west of Saxlingham Nethergate, east of Tharston and south of Newton Flotman and Flordon. The name Tasburgh may derive from the Old English meaning ‘Tæsa’s fort’. The parish has a long history and was well established by the time of the Norman Conquest. Its population, land ownership and productive resources were detailed in the Domesday Book of 1086. This document revealed that the lands were part of Roger Bigot’s holdings and that the parish had a stake in a mill. The earliest signs of human occupation in Tasburgh are provided by flint pot boilers (NHER 10109), which show evidence of the heating of water probably for washing and cooking purposes. In addition to these pot boilers, there are a large number of prehistoric worked flint objects (e.g. NHER 13931, 19000 and 20927) on record for the parish. However, a number of these flint implements have been dated to specific periods of prehistory. These include Mesolithic flint flakes (NHER 9983) and a microlith (NHER 19006) and two Neolithic/Bronze Age stone axehammers (NHER 9972 and 9974). Pieces of Bronze Age pottery have also been retrieved, including part of a beaker (NHER 1135), a characteristic find from the early part of this period. A couple of possible Bronze Age ring ditches (NHER 16838) have also been noted to the south of Hall farm. The Iron Age may have been a significant period in the history of Tasburgh. A probable hillfort (NHER 2258) exists to the west of the Preston VC High School. It has a single rampart about 3m high, which encloses an area of approximately 20 acres. This site has been extensively studied and a large number of Roman, Saxon and medieval pottery sherds and metalwork items have been recovered. Surveys have also identified numerous features comprising, amongst others, medieval ditches and pits, Saxon hearths and metalworking areas and prehistoric pits and postholes. The discovery of the remnants of Late Saxon defences also raises the possibility that this was once a burgh. The only Iron Age finds comprise a terret (NHER 16838) and part of a silver torc (NHER 31188) (although this may be of Viking date). The paucity of finds from this era may seem slightly surprising given the presence of the hillfort, so it is possible that other Iron Age items merely await discovery. No Roman sites have been recorded in Tasburgh. A Roman altar (NHER 9979) has allegedly been found, but there are few further details to substantiate the truth of this claim or locate the altar. The best Roman artefacts that have been discovered are a beautiful finger ring engraved with a motif of a bird or animal (NHER 32279) and a vessel in the shape of a lion (NHER 20928). All the other finds are mundane items like coins (NHER 9980 and 9982), pottery sherds (e.g. NHER 17050 and 20484) and brooches (NHER 9981). During the Late Saxon period it is possible that a burgh existed on the site of the hillfort (NHER 2258). It also seems likely that St Mary’s Church (NHER 10104) has Saxon origins, as attributed to by the presence of the church’s round tower with traces of blind arcading. Otherwise the Saxon period is solely represented by small finds. Many of these take the form of pottery sherds (NHER 20486 and 14867) and brooches: with both Early Saxon and Late Saxon examples being reported (NHER 16838). However, the finest artefact is of Viking origin and was clearly imported. This superb openwork brooch (NHER 20928) has decoration in the form of animal heads and rosettes and would have been a prestigious item to own. During the medieval period St Mary’s Church (NHER 10104) was in operation. 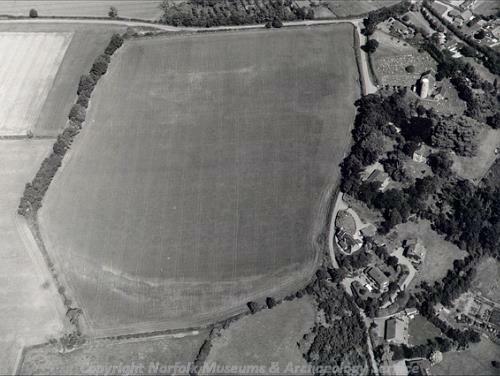 However, it has been speculated that a chapel dedicated to St Michael also existed in Tasburgh (NHER 9977) and this has been identified with a moated site (NHER 9977). A study of this area recorded flint building rubble and the remnants of house platforms, meaning this was more likely to be a domestic site than the location of the chapel. Several of the buildings in Tasburgh have medieval origins. Old Hall Farm (NHER 17241) sits on a possible medieval manorial site, and the house itself takes the form of an open hall medieval building with a cross wing added to the north. Similarly, Rookery Cottage (NHER 20485) was once a medieval hall house with an open smoke bay, although much of what is currently visible is of 16th century or later date. Timber-framed properties like Meadow View (NHER 36669) and White Horse Farm (NHER 16533) were also probably built during the late medieval period. White Horse Farm (NHER 16533) is a particularly striking building with its thatched roof and four separate polygonal brick chimneys. Metal detecting and fieldwalking have recovered a number of medieval objects. Finds of note include a brass finger ring (NHER 9983), a strap end in the shape of a tree (NHER 35026), part of a candlestick (NHER 35334) and a copper alloy vessel (NHER 32277). However, one of the most intriguing finds is a stone trough (NHER 17242) that stands in the garden of the Firs (NHER 43912). This object supposedly came from Norwich Castle after it had ceased to operate as a prison, and could have been used by the prisoners to wash in. The records for post medieval Tasburgh are dominated by a large number of fine buildings, listed as properties of architectural interest. As such, it is only possible to mention a small selection of them here. Tasburgh Hall (NHER 9995) was built in around 1885 in a Neo-Jacobean style with stepped gables. Some of the internal rooms are notable for their lavish panelling. In contrast to this grand abode, Mistletoe Cottage (NHER 12133) was built in about 1750 for the poor of parish. It was converted to two cottages for road menders when the Pulham workhouse was erected and became a single private residence in 1929. Another building of interest is the Countryman Public House (NHER 19252), which stands three storeys high and has Dutch gabling. This form of public house is very similar to others in the area, like the Anchor in Coltishall, and it is probably of 18th century date. A couple of non-secular buildings were also present in Tasburgh at this time. The Quaker Meeting House (NHER 15979) dates to the 17th century, but was purchased for use in 1707. A number of gravestones exist in the grounds of the property, a rare occurrence in an era when there were prohibitions about gravestones outside churchyards. Additionally, an ancient hollow oak known locally as 'Boadicea's Oak' (NHER 40163) stands nearby, although the reason for its name is unclear. The Rectory (NHER 43904) dates to the early 19th century, although the date at which it became a private dwelling is uncertain. The most prominent feature of this building is the heavy central doorcase with pilasters and an entablature with a pediment. Many of the other post medieval buildings can be seen on Church Road (NHER 40327, 43907 and 43908), Lower Street (NHER 40657, 43912 and 48895) and along Norwich Road (NHER 41238, 41240 and 43915). The proximity of the River Tas allowed several mills to be set up in the post medieval era. Tasburgh Mill (NHER 9994) appeared as a windmill on a 1797 map and a postmill on a map of 1834. Later the mill here operated in conjunction with a watermill, which is now recognisable as Watermill House on Low Road. Another windmill and watermill were in operation at Mill Farm (NHER 15554) according to 17th century documents. The still-standing timber-framed mill house here dates to the 17th century. The majority of post medieval finds comprise pottery sherds (e.g. NHER 20433 and 40993). Other artefacts tend to be equally mundane and consist of coins (NHER 39885), a worn sword belt mount (NHER 35027), a German jetton (NHER 35026) and fragments of clay tobacco pipes (NHER 19006 and 17856). Sadly, no sites or finds relating to World War One, World War Two or the modern period have been reported in Tasburgh. Thomas Sunley (NLA) 25 July 2007.